Dual ISO Processor will traverse all folders within a specified root, find CR2 or DNG image files, and batch process them using cr2hdr. The application is multi-threaded, and allows as many threads as your number of CPU cores. The user is also free to decrease the number of threads in use, just in case they are using the system for other work. They can increase them back to the max allowed, whenever they please. This application has everything I love about batch/long process applications: A friendly GUI, log files, Progress bars and Time Remaining/Elapsed counters. It's open source, so feel free to either suggest improvements or build them yourself! Ok, gave this a test today. I could have used this last October after returning home from a "Bucket List" holiday. The application installation doesn't adhere to common windows standards. i.e. : 32 bit programs should be installed to the “Program Files (x86)” folder and 64bit programs should be installed to the “Program Files”. As a result, the user AppData directory which, in a default Windows installation is a hidden directory is now exposed introducing a potential risk to non power users. 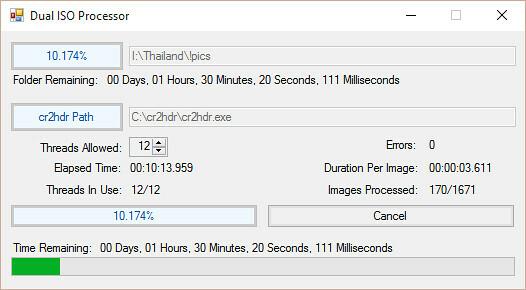 On first use, it is exposed via the "Set Image Folder" and "Set cr2hdr Path" buttons whose dialogue boxes open within the applications installation directory. Subsequent uses default to the last selected path which is ok. Installation be changed to comply with Windows standards. "Set Image Folder" and "Set cr2hdr Path" buttons be changed to open in the users default image/pictures and possibly documents directories respectively. Default settings for a first pass bulk process is fine however, after a review of the processed images, alternate or debug parameters settings may be required for reprocessing. From a user perspective it would be preferable to select the run time parameters here rather than use another app to do this. Expand GUI to include a selectable list of parameters to be passed to cr2hr and build the run command based on the selections. Unlike CR2 files where the original source files are retained, for DNG files they are lost. Copy all DNG files to an Original DNGs folder prior to processing. This is confusing as the outcome is inconsistent with the folder naming convention. Either rename the folder to something like "Processed Originals"
Create another subfolder "Non Dual_ISO CR2s" and move the "non dual_iso CR2s " files there. Any of the above would then make it very clear to the user what they should expect to find within the process folders. When initially setting the cr2hdr path using the "Set cr2hdr Path" button the actual path selected was not displayed in the value filed beside the button. I ended up copy and pasting the value in. Subsequent launches retained and displayed the path. Anyway that's my 2 cents worth. With a bit more refinement, I can see this becoming a very useful tool in the ML communities toolkit. Ottoga, thanks for the extensive feedback. I appreciate it. I will try to implement these changes as soon as possible! This looks great and works a treat when I get the right cr2hdr folder ;I didn't delete the old ones! Do you find it better to pre-process than to use the lightroom plugin ; I have only just started using it (and hobby digital photography for that matter) , but LRcc seems to leave non-dual cr2 in their folder untouched, makes the DNG to selected folder, annd leaves original in original folder as well , reporting the non-dual files at the end of the batch. I am not yet used to LR catologues / and collections , but seeing others use it easily, I suspect I might find it easier with time and do the batches there? For now, I will use your batches with great thanks! 70d feb 2016 ; ML version 70D version A [ https://builds.magiclantern.fm/jenkins/view/Other%20tasks/job/cr2hdr-20bit/ ]; AUTOettr going well ; very new 2016 ;thanks to A1ex et al v much! Has this been updated since release? A MAGIC 7D and 5D III + Lenses in the range of 15 - 400mm. Man it's shining.. it's a Lantern oh it's Magic, Aha it's Magic Lantern! Wish I knew how to program so that I could make the changes that you suggested, it has the potential of being an incredibly nifty little program that would fit right into my workflow once polished a bit. Still useful though albeit a bit quirky especially the fact that the settings has to be done out of the program.. So thanks kidfob for a nice app and I wish I could help make it mature and thanks Ottoga for very constructive testing and well related findings I would never have been able to express it as clearly as you did. Sorry for the lack of updates guys. Things have been busy. I will implement them in the next month though. To make it easier on me can you all list out the features you want and assign a high,med,or low priority to each?